I have been working on getting his nursery up and running. Clothes clean, crib placed, diapers in, and a few décor pieces added – Check! Check! Check! and Check! The theme is beach and animals placed with hues of teal, coral and yellow. A gallery wall art is on the far wall and has been left with blank picture frames for a while. At first I was going to fill them with pages from a story book that use the room colors. 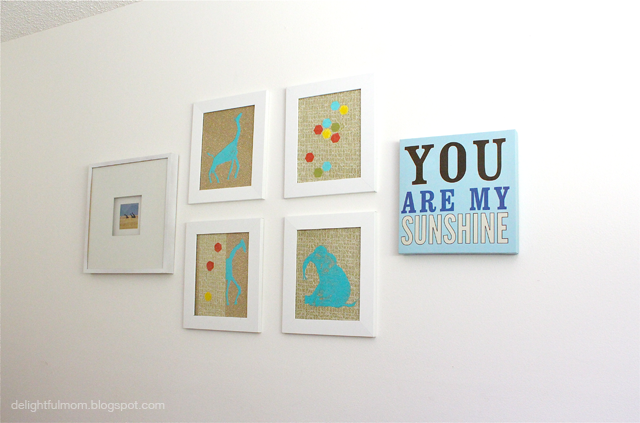 But then I came across a few prints I from Pottery Barn Kids that I fell in love with! Sorry, I tossed the catalog and can not find the image to show you. But it is similar to the elephant. 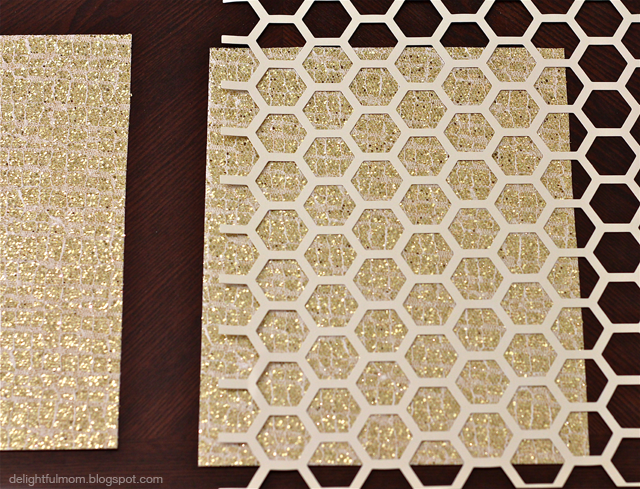 The honeycomb stencil is found at Michaels Arts & Crafts in the decorative paper section along with glittery craft paper. I used two different textures of gold glitter paper. 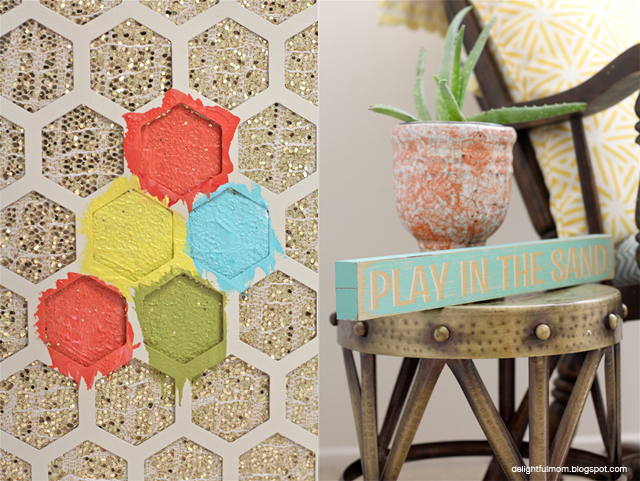 On one of the frames I stenciled a few honeycomb designs using the room colors and skipped every few. Then painted a giraffe and elephant on the other two frames using acrylic paints with a foam paint brush. I did not use the paint thick as I wanted you to see the glitter through the animal. 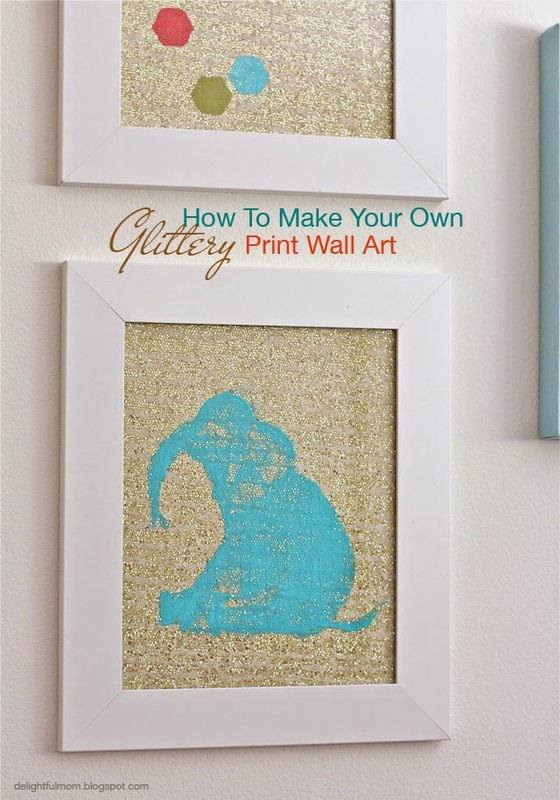 The print with the giraffe and glitter over him with honeycombs was actually a mess-up of the first giraffe. His belly was too large and he looked funny. So I added a strip of glitter paper over my mistake and blended other designs in it. Turns out the mistake made all four of the pictures come together! Editor: This post was originally found on delightfulmom.blogspot.com, but that site has been removed. This crafty post has found new life here at BigDIYIdeas.com.